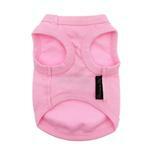 Show your dog's sweet side in the Lil Angel Dog Tank by Parisian Pet in Pink! 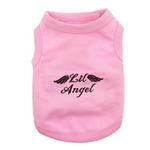 The Lil Angel Dog Tank shows all the pups who is being good! This quality tank will make a lovely gift for pet owners and their beloved pups. A perfect addition to any dog's wardrobe, this tee is made of soft and cotton and is completed with lettering in a cute font and framed in angel wings. This cute pink tank lets the world know that your dog is a well-behaved little lover. It would make a great gift for Mother's Day or would be cute to put on a puppy when delivering him to his new mother. Your dog will love the feel of this soft and luxurious dog tank top. The high-cut tummy will ensure your pup stays clean and dry all day. This pet tank top is so soft and comfortable, even cats (especially the hairless types) will like showing that they are purrfect little angels too! No worries if your mostly perfect pet still manages to get this tank dirty because it's machine washable! Wash in warm water on a gentle cycle with a mild detergent. We do recommend laying it flat to dry since it is 100% cotton. Lil Angel Dog Tank by Parisian Pet - Pink Customer Photos - Send us your photo! Yep my little girl is a true Angle. Even when she is naughty she still my little angle. Aren't we all angels when we are sleeping? This tank rub=ns small, order 1 size up and you will be happy, my dog is 11 lbs i have the large, fits her very good, I do have the medium too thats why i said order 1 size up. Posted On 12/26/16 by Janet L from Bensalem , PA Yes, Janet L recommends this product! Great color. Nice embroidery. Washes well. Wonderful quality. A must for the well dressed dog. My dog is only 5 pounds/returning shirt runs small. Very disappointed/loved the shirt, but sizing chart not accurate. Posted On 08/03/16 by Lauren H from allentown, PA Yes, Lauren H recommends this product! I love this tee on my dog. this tee makes my dog more adorable !!! Posted On 06/17/16 by Jane H from Bainbridge, OH Yes, Jane H recommends this product! My little yorkie (3lbs) name is Angel. This is just to cute for words. I love it. Pleasant shopping experience. Friendly staff. Great variety of products.